1 of 4 Heat oven to 400 degrees . Heat a large nonstick skillet over medium-high heat. Crumble in sausage and add onion. Cook 5 minutes, breaking sausage apart with a wooden spoon. 2 of 4 Stir in quinoa and cook 2 minutes. Remove from heat. Stir in parsley and balsamic vinegar and let cool slightly. Fold in egg and 3 tbsp of the shredded Asiago. In a small bowl, combine remaining 3 tbsp shredded Asiago and the bread crumbs. 3 of 4 Coat rounded side of mushroom caps with nonstick cooking spray. Place rounded side down on 2 large baking sheets. Divide filling among mushroom caps, about 1/3 cup per portobello. Sprinkle each with 1/2 tbsp of the bread crumb mixture. 4 of 4 Bake at 400 degrees for 18 to 20 minutes, until tops are browned and filling registers 160 degrees on an instant-read thermometer. 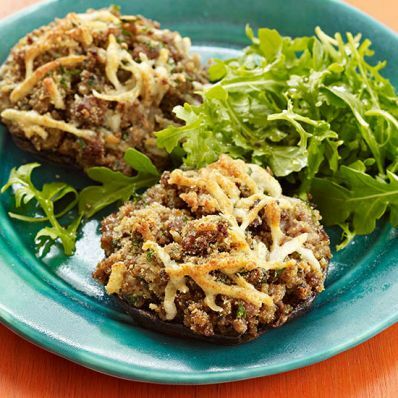 Serve 2 mushroom caps per person with, if desired, 11/2 cups green salad on the side.